“I’ve been running my operation for 12 years and have used several different mineral products. About a year ago, I switched to Kay Dee’s Super Ranger 8.2 Granular Mineral with CTC. Although the cattle ate a lot at first, they backed off after a few days. Weather doesn’t affect this mineral at all, and it holds up in the elements. “My husband has over 65 years of experience in registered polled hereford breeding. I’ve been involved in the business for about 13 years. Since then, we had tried many different mineral products before switching to Kay Dee’s Granular Calving Mineral (CLR). Before making the switch, I compared Kay Dee’s tag to several others - it was a superior product. Kay Dee’s Calving Mineral was priced higher than other mineral products, but in the long run it’s given a great return on our investment. We’re very pleased with Kay Dee’s Granular Calving Mineral. 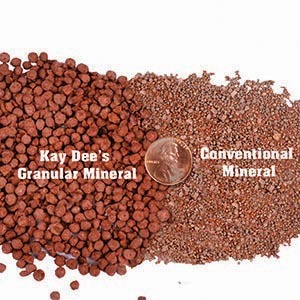 “This year, I began using granular mineral products from Kay Dee, and I’ve been happy with each one I have used. I started with the co-product balancer on dry gestating cows in late winter prior to calving. A week before pasture turnout, I switched to the high-mag mineral for grass tetany season. In late spring, I started the cows on the calving mineral – CLR with CTC and IGR for fly control. This product worked great – flies were minimal, cows achieved a 96% conception rate, and the calves weaned off at heavier weights than in past years. “I started using the Kay Dee Summer Granular Mineral with CTC & IGR about 4 years ago in early spring. Once summer hit, my cows weren’t huddled together trying to avoid ﬂies like they were in some of my neighboring pastures. Instead of standing in slews, my cows were out on pasture grazing. Because of this, my herd experienced almost no foot rot issues. My cows didn’t have runny eyes or pink eye issues either.